Sterling, New York, 2009. 40 pages. 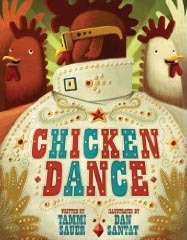 Here's a hilarious, completely fun tale of two chickens pursuing their dream. Marge and Lola see a poster about the barnyard talent show, with top prize tickets to the Elvis Poultry Concert. But what can they do for talent? The ducks taunt them every step of the way, since chickens can't swim, and can't fly. I love the way the ducks get their comeuppance and the chickens have their dreams come true -- even without actually winning the talent show. This story is short enough and full of action enough for preschool storytime, but also has plenty of humor for the parents to enjoy. I only wish I did a better Elvis voice. Delightful! It will have you flapping and shaking.